I can’t truly describe how opening this app up feels like. Mr. Falling pretty much has a cat falling to his death at ridiculous speeds smashing into stairways, broken cement, and other random things. There is no gore or violence and most of what you hear is “Woo Hoo! !” and hitting something makes it seem like the cat is still ok (probably landed on his feet). Well, thankfully I am a dog person, so Mr. Falling is disturbingly fun. Released by UwinGame Inc, Mr. Falling is available on the iPhone, iPod touch, and iPad for $0.99. There are reports that it does not work on the 3G devices. Just a warning. There is something appealing about this game that really shines through during gameplay. Maybe it’s that these cats are legitimately having fun while ‘skydiving’ through narrow obstacles. They exist in a world where plummeting infinitely and smashing into objects is perfectly fine, so if you love cats, don’t worry, no cat was hurt in the creation of this game. Seriously though, this is an intense, fast, and impressively simple game app. You control by tilting the phone in the direction you want to head in. The game seems to auto-calibrate to your comfortable holding position because even while sitting normally with my iPhone angled towards me, it works perfectly. You control the first person view of a cat that is sky diving past 4 very long buildings joined by stairs, cement floors that are destroyed for some reason, and tons of flower beds. Steer through the holes and open gaps to prevent you from colliding into objects. Mr. Falling provides two modes: Death Mode and Time Mode. Don’t read too much into Death mode. It’s basically a mode where if you touch anything, you lose. The cat still harmlessly lands and the adventure ends. Time mode has it so you only have to gain the furthest distance possible evading obstacles. If you hit something in Time mode, you will bounce harmlessly off and you can continue your free fall. Powerups provide massive speed boosts and they allow you to clip right through obstacles to help increase your distance record. The graphics for Mr. Falling is alright. 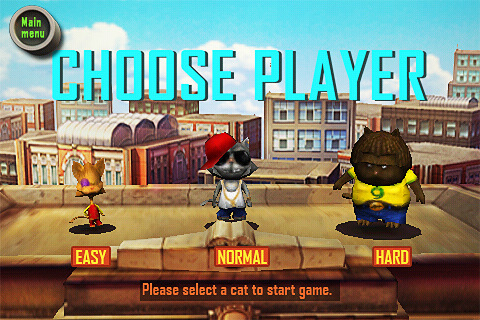 The cat models are only seen for a few seconds when you choose difficulty and run through the tutorial. After that, you zoom into the back of their heads and go into first person. The buildings look alright. A constantly repeating pattern can hurt your brain but this one was very well done with soft colors, changing colors and patterns to give the buildings a different feel every few seconds, and the glare/wind moving effect breaks the patterns up even more, making this easy on my eyes. Obstacles like the flowers, stairways, etc., are decent, but since you are usually flying by them, it’s hard to comment on many of them. They look low-res once you land on them and have time to see the object close up, but who really cares? You spend the entire game seeing them as an afterthought so really, they just do a great job not being distracting. AppSafari review of Mr. 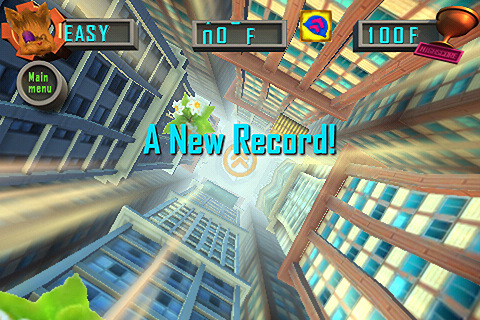 Falling was written by Joseph Ho on December 13th, 2010 and categorized under App Store, Fun, Games, Racing. Page viewed 3641 times, 1 so far today. Need help on using these apps? Please read the Help Page.